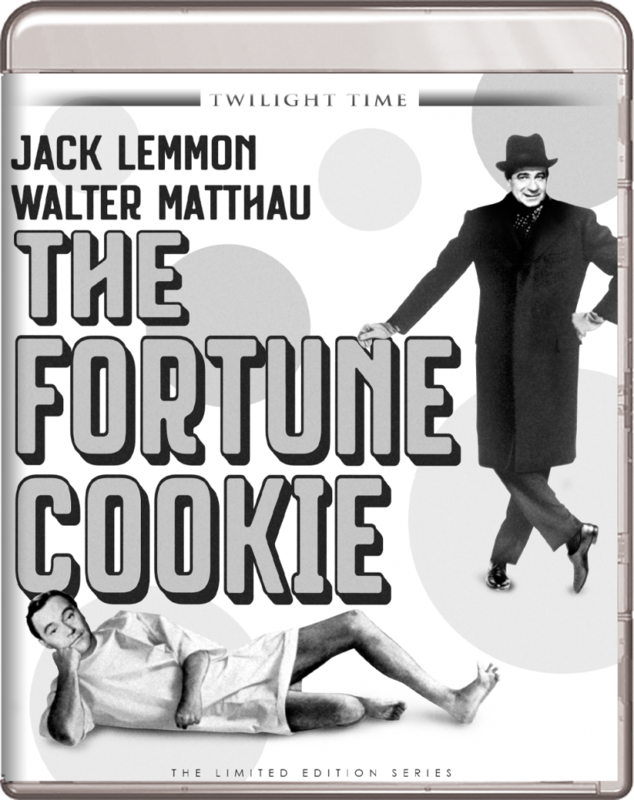 Blu-ray Review: The Fortune Cookie! We all miss Jack Lemmon and Walter Matthau. They had such excellent chemistry together through the years. They starred in ten feature films together from Grump Old Men to The Odd Couple and everything in between. The duo had such comedic timing and love for each other that it just oozed off screen in and into everyone’s hearts. Their first film together was called The Fortune Cookie and cemented a life-long friendship and partnership in film that would last decades. CLICK HERE TO PURCHASE ‘THE FORTUNE COOKIE FROM TWILIGHT TIME! In 1966, the award winning filmmaker Billy Wilder (Some Like it Hot), made a comedic film with Lemmon and Matthau. Originally, Wilder wanted Frank Sinatra and Jackie Gleason to star in the film, but was convinced by Lemmon to take a chance on himself and Matthau. Luckily for audiences world wide, Wilder agreed and the rest is Hollywood gold and to our wishes, we got a lifetime of Matthau and Lemmon doing what they do best on screen. While being a comedy film with these two funny men, Wilder also took a somewhat dramatic approach to the story and characters, in that almost every character here is fairly unlikable, and the actions of each character make you want to leave them by the side of the road, even though they are very charismatic. The Fortune Cookie follows Harry Hinkle (Lemmon), who is a cameraman for the NFL. At a big game, he is knocked over by a football player during a game and goes flying in the air. He ends up in the hospital with a minor concussion. His brother-in-law William Gingrich is the first one to visit him in the hospital and happens to be a lawyer. In fact, he is quite the twin to Saul Goodman from Breaking Bad and Better Call Saul, as he’s an ambulance chaser and convinces Hinkle to play out a scam in being more injured than he really is to sue the insurance company for a million dollars. After a few arm twists, Hinkle plays along, mostly due to the face that his ex-wife starts to show interest in him again for the possibility of more money. What Hinkle doesn’t notice at first is that the football player, Luther Jackson (Ron Rich) that accidentally ran into him on the sideline now feels extremely guilty about Hinkle’s non-existent injury and begins a downward spiral in playing football and turns to drinking and quitting football, due to the guilt and depression he feels for hurting someone. It’s a sad story really, but told in a darkly comedic way. With private investigators spying on Hinkle and Gingrich to see if their story checks out, it’s funny to see the lengths they will go to keep the fraud up, but it also shows the bitter side of humanity as well, just to gain a quick buck. Matthau simply shines in this role as the shady lawyer, where you’ll definitely be able to see many shades of Saul Goodman here, which is always funny. Not only that, Matthau’s physical comedy is solid gold too. 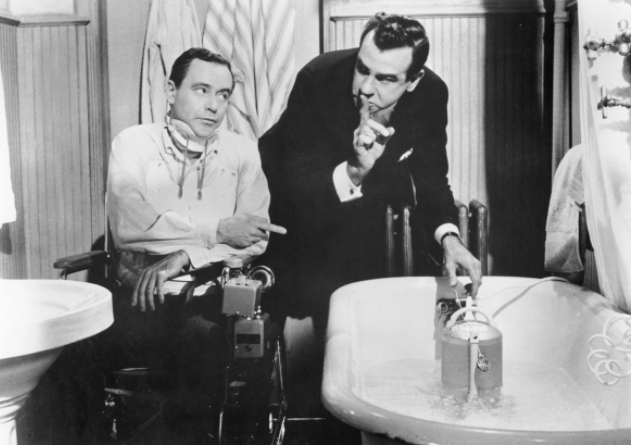 Lemmon is great, but is mainly in the wheelchair for the whole movie to sell his fake injury. The Fortune Cookie is an excellent movie that is not only funny, but has a ton of heart and shows the ups and downs in humanity. Plus, it gave us the duo of Matthau and Lemmon. The Video: The Fortune Cookie comes with a 1080p HD transfer and is presented in 2.35:1 aspect ratio. This black and white presentation looks quite good, despite a couple of flaws. The detail is sharp and vivid throughout with great closeups that reveal individual hairs and big threads in the heavy clothing. Wider shots never go soft either. The whites and blacks are well balanced with no evidence of any bleeding colors in any kind of light. In fact, black levels are deep and inky. There are still some instances of dirt, debris, and scratches throughout, but that’s about it for problems with the image. This is a faithful presentation to the original release and looks great. The Audio: This release comes with a DTS-HD MA 1.0 Mono mix that sounds great. Don’t expect tons of explosions or gun shots here. This is a dialogue driven comedy film with rapid fire dialogue, which is always crystal clear and easy to follow along with. The score sounds great too and never drowns out any other sound aspect. Sound effects are full but don’t sound as realistic as they could be, but that’s an audio source issue. This is a well balanced sound with good depth, just don’t expect a fully immersive experience, especially at the football game. Isolated Music Track – You can listen to the music only track of the film here in DTS-HD 2.0 stereo. Theatrical Trailer (HD, 2 Mins.) – Original trailer for the film. Booklet – Here is Twilight Time’s booklet with an essay by Julie Kirgo on the film with some photos from the film. The Fortune Cookie is a damn good film that brought us Jack Lemmon and Walter Matthau together, where they went on to make nine more films together. Billy Wilder captured both sides of humanity nicely here without hitting you over the head too much. The chemistry between Lemmon and Matthau is instant from the start and never lets up. The video and audio presentations are both great, but there are no real extras here. It would have been nice to have something about this movie. Still, this one comes Recommended! Blu-ray Review: ‘How to Steal a Million’! This entry was posted on Monday, May 1st, 2017 at 12:00 pm	and is filed under Film, News. You can follow any responses to this entry through the RSS 2.0 feed. You can skip to the end and leave a response. Pinging is currently not allowed. « 4K UHD Review: 3:10 to Yuma! If we can outrun her, we can take her. We should turn and fight.